have your beer and eat it too | I Should Cocoa! I promise this will be the last cupcake post for some time. They’re just really fun to make and then give away to all the people you know so that you don’t have any left in your house to tempt you late at night, after feeding the cat, while doing the dishes, or for breakfast as part of a not-so-healthy diet. I like chocolate cupcakes, but sometimes that’s too easy and boring for me. (Even with the vegan ones, I really feel that adding the chocolate chips to the batter added some needed oomph, although the cupcakes are yummy on their own.) So, when I came across this Dave Lieberman recipe for Guinness stout chocolate cupcakes it was a melding of all things delicious in my life coming together in perfect harmony. Guinness already tastes like a meal – malty, bittersweet, rich, and creamy all at the same time. It’s the perfect foil for chocolate, really. This recipe would probably be excellent substituted with Young’s Double Stout which tastes like Cadbury chocolate beer to me. But don’t be dismayed if you are not a beer-drinker: these cupcakes don’t taste like beer. They taste like a rich chocolate cake with…..something….what is that other flavor? Is it a different spice? Is something healthy like a vegetable sneaked into here? If you give these to your friends, they’d never know what that mystery ingredient was, until you point out that particular malty bite – then of course! it’s all so apparent now. The cream cheese frosting pairs perfectly with the Guinness flavor – however I added scraped vanilla bean with delicious results. 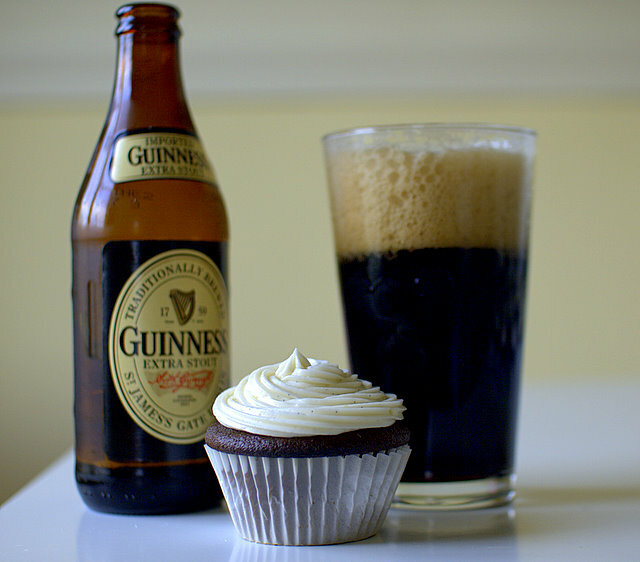 You could also use the mascarpone frosting from the carrot cupcakes or a vanilla buttercream, but I’d definitely keep the topping white to mimic the head of a cold, refreshing (and filling) freshly pulled pint of Guinness. This entry was posted in baking and tagged baking, beer, chocolate, cupcake, guinness cupcake, vanilla. Bookmark the permalink.